Click on the picture above to enlarge! If you would like to make your order a little bit more special, just select quantity and type of something below. 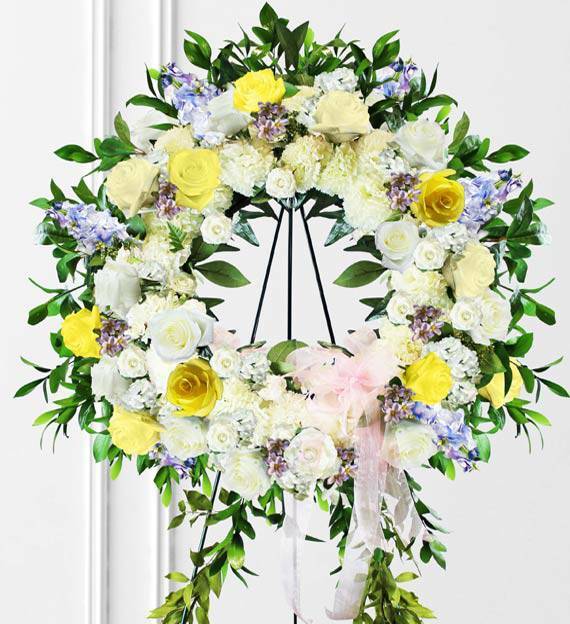 A graceful wreath of pastel colored blooms is a special way to honor a loved one. Fresh flowers are artistically arranged to create a beautiful sympathy wreath. It will warm hearts and lend comfort to those grieving. *Bows and Ribbons depicted in this arrangement are not included. Item pictured is a depiction of an arrangement that we will make as similar as possible with the same look and feel. When available this item is hand delivered by your top ranked local florist. Place your order by 2pm local time Mon-Fri to ensure same-day delivery. Store your arrangement in a cool place away from direct sunlight and make sure to keep the floral foam hydrated by adding water every other day.